Parveen, a 23-year-old woman with a postgraduate degree, works out of a small IT center in Gulmit, Pakistan where she is busy learning about data entry. Parveen’s class has an almost equal number of male and female trainees. For them, earning a paycheck at the IT center by working online with computers, doing data entry, and generating content for e-commerce portals, is a big step up from tilling the land. Earning roughly $100 per month through this work is a welcome change for Parveen– one never before imaginable in her town, or more generally in Pakistan, which has the lowest GDP per capita for women in South Asia. A small town of about 4000 inhabitants in the country’s Upper Hunza-Gojal region, Gulmit is located approximately 4,877 meters (16,000 feet) above sea level. Since 2010, Upper Hunza-Gojal has been cut off from the rest of Pakistan by the Attabad lake disaster on the Hunza River, which caused devastating flooding and landslides. While the literacy rate for the under thirty-age group is 100 percent, Gojal’s inhabitants are largely unemployed and survive on food aid from China. For the past few years, I have been closely associated with an NGO called KADO (Karakoram Area Development Organization), which works in the area particularly in the Hunza valley. While no official statistics are available, an estimated 90% of Hunza’s educated population is unemployed. With each household averaging eight people, only male household members typically earn an income. The largely unemployed female population works in the fields or helps with household work. 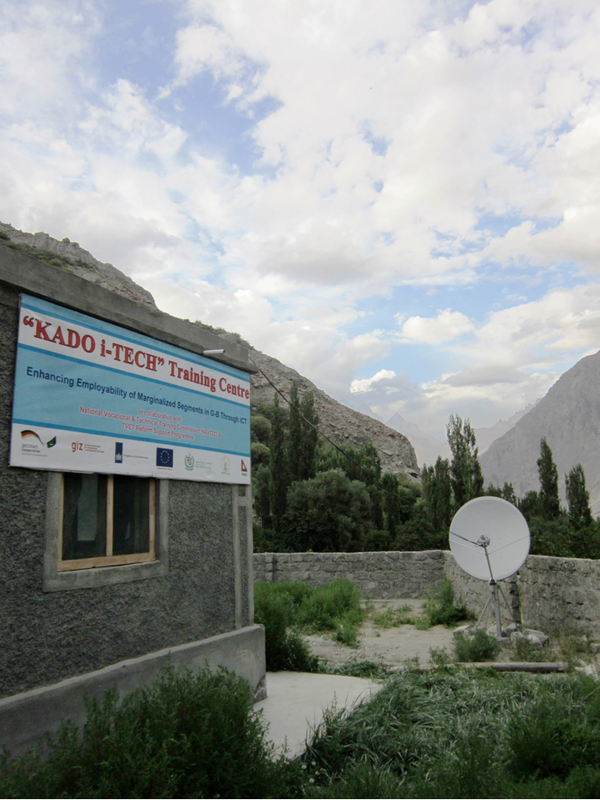 Since 1996, KADO has focused on integrated development in the mountainous areas of Pakistan’s Gilgit-Baltistan province. It has been particularly focused on coming up with innovative ways of using IT to further its development objectives in the region. Some years back, the organization started an Internet café in Karimabad, a town in central Hunza. At the time, Karimabad had a 100 percent literacy rate among those aged 30 and younger. Many of the town’s young people held post-graduate degrees from some of the best universities in Pakistan. But, in Karimabad, which had a population of about 12,000, jobs were hard to come by. Initially, the Internet café ran at a loss because of an unreliable Internet connection and power breakdowns. However, instead of shutting down the initiative, KADO’s CEO agreed to run the café as a training center for local women to work on micro-tasks through CrowdFlower, an online platform that enables remote workers to complete small online jobs, as well as its partner, Amazon’s Mechanical Turk. Mechanical Turk. On both platforms, workers log onto a large database of tasks, select the ones they feel comfortable attempting, and earn money on a per-task basis. For participants, the results were heartening: after merely a month, female trainees earned between $30 and $70. With no alternative employment opportunities, $35 is a life-changing sum. Not only does it help support a woman’s family but it also empowers her emotionally and psychologically. As Karimabad’s Internet café demonstrated, online work could bring real change and transformation to the area. Today, KADO operates eight IT training centers (seven fixed and one mobile center) with funding from foreign NGOs. More than 200-300 local residents are enrolled in courses that range from e-marketing, e-accounting, content writing, and programming to foreign exchange market trading and web design. It is projected that, within two years, around 2,500 youth will pass through the training center, gaining the skills to obtain jobs off and online. The IT training centers represent an even greater opportunity for the young women of the region. Although barriers to education have been somewhat lifted (according to a 2011 UNICEF survey, sixty-one percent of Pakistani women between the ages of fifteen to twenty-four are now enrolled in schools or colleges), the ability for female family members to work, especially outside the home, is hamstrung by social taboos. In a patriarchal society where honor is valued above everything else, women’s employment threatens and undermines men’s positions as the heads of households. Breakdowns in Pakistan’s security sector, and the absence of law and order, have only aggravated the situation further. Even those families that are less conservative worry about the safety of their female members in the work force. In Pakistan’s three largest cities – Islamabad, Lahore, and Karachi – things are quite different, however. In these bustling metropolises, women work in all walks of life. Still, many jobs in these cities do not accommodate women’s needs. My first and only job was teaching. I left after three years, because I was not granted maternity leave after giving birth to my child. When I discovered online work, I found an opportunity to balance my responsibilities as a woman and mother with my desire for a career. While there are no exact statistics on the male-to-female ratio of online workers, based on meeting people and interacting online, I have observed many female service providers working for these online portals. Given the opportunities they provide for remote work, there is a huge incentive for women to study IT and take up these positions. For conservative families concerned about the safety of their female members, these positions give them the peace of mind they are looking for. Until recently, the mere thought of working via the Internet for someone thousands of miles away was mindboggling. Today, however, Pakistan is a leader in online work, ranking fourth in skills, on a list of 158 countries, and third for total earnings. This alone speaks to the talent in the country. Women are at the forefront of this surge. Online work is transforming the role of women across Pakistan and offering opportunities for them in IT and beyond.